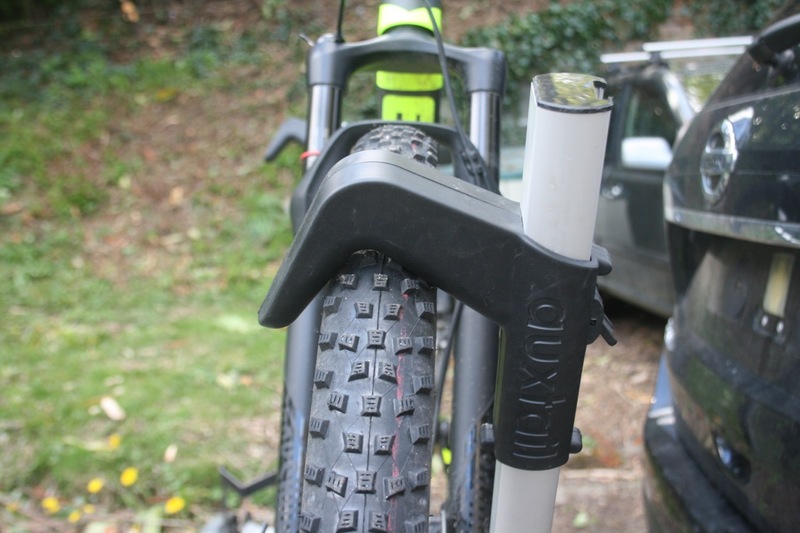 Review: Auxtail Cycle Carrier. A bike carrier that’s even better if you have a Nissan. 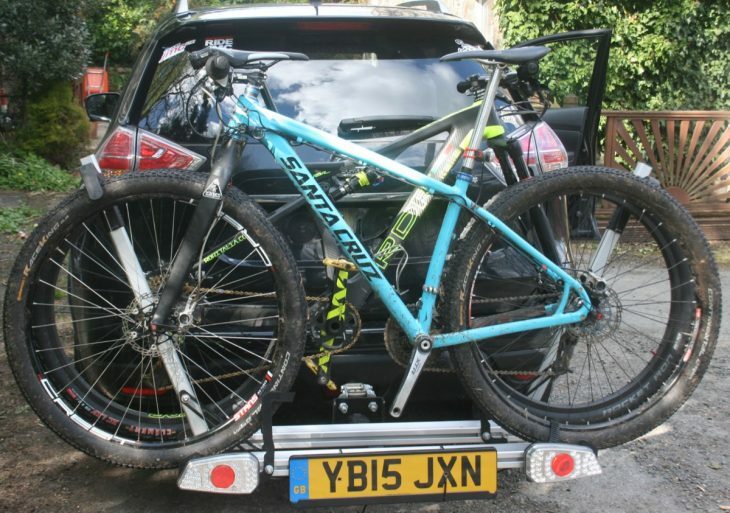 For those of us that don’t own vans and have families that probably don’t want to share their personal space with a muddy, awkwardly-shaped bike while on a car journey, the only practical option to transport bicycles is one of the many different types of cycle carrier. Rear-mounted racks have a few advantages – they’re dead easy to attach a bike to and they don’t have too much of an impact on fuel consumption or cause too much extra wind noise. But they’re generally more expensive than roof-mounted racks and are a lot heavier. 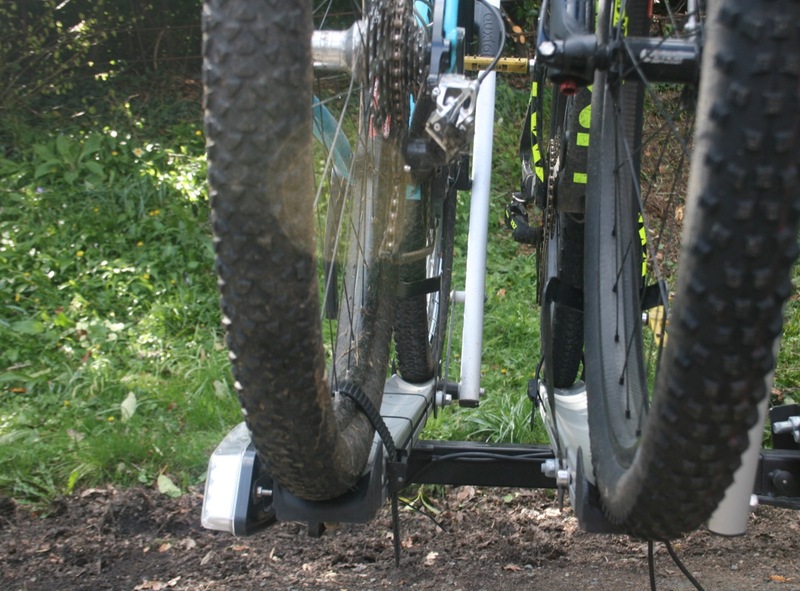 Even a ‘compact’ version of a leading-brand towbar-mounted cycle carrier weighs about 60 kilos, which is admittedly very sturdy but you’re going to be doing some grunting and complaining when you put it on or take it off. Fully loaded – and not a frame clamp in sight. This Auxtail rack on the other hand weighs just 13kg and is available as a flange towball-mounted version, a ‘swan neck’ towbar type or a type specifically for the Nissan Qashquai (Craig Broadbent, the chap that designed the Auxtail used to work for Nissan). The one tested here is the flange towball-mounted version. The rack doesn’t actually fit ON the towball. You have to take the towball flange off (it’s normally attached to the rest of the towbar with two large bolts) and then fit the Auxtail mounting plate, sandwiched between the towbar and the flange. Once you’ve done that (admittedly you might need to take it to someone with a very large spanner who knows what they’re doing) you can fit the assembled rack to the mounting plate, check the spring-loaded retaining pin has clicked into place and connect the electrics for the LED-equipped lighting board. Rack fits on via a mounting plate. Out of the box, the rack needed to be assembled but once I’d worked out that the instructions were for both versions of the rack it was a straightforward job, needing no special tools. 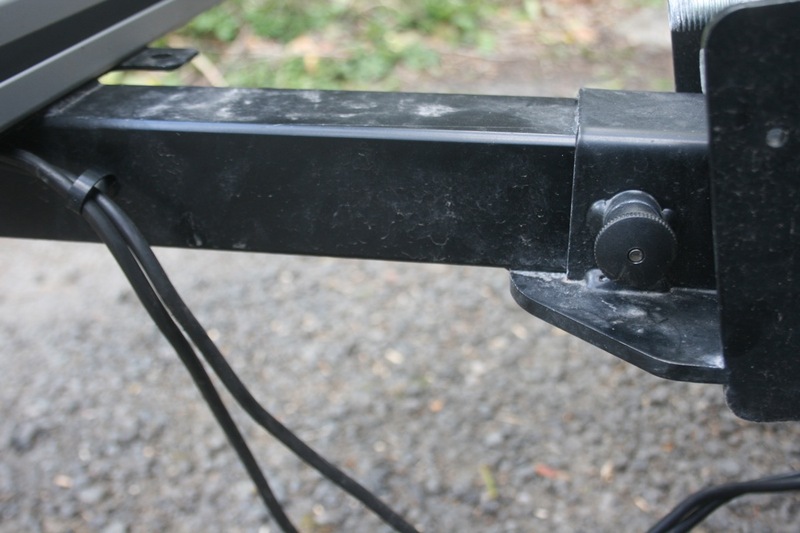 It’s an aluminium and steel rack consisting of a box-section main ‘beam’ onto which two bike carriers are attached. The carriers each have a pivoting arm and a steel guide to secure the front wheel, meaning that there’s no need for the frame to be clamped. 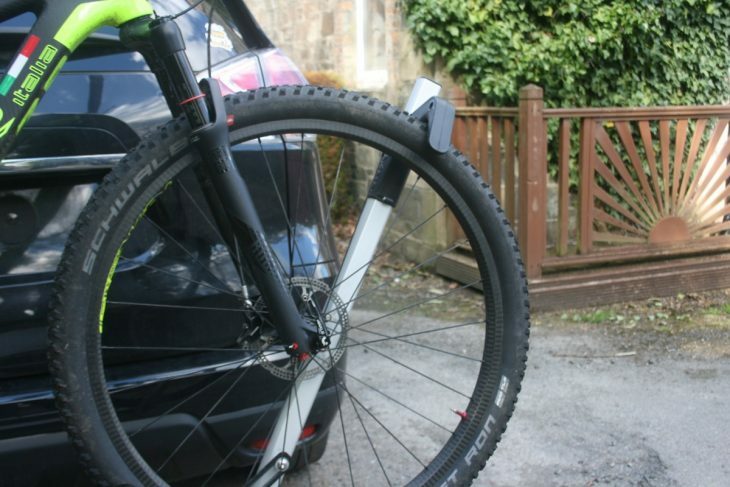 Good news for carbon frame owners and those of us who have a thing about scratching paintwork. The rear wheel is secured with a simple ratcheted strap. 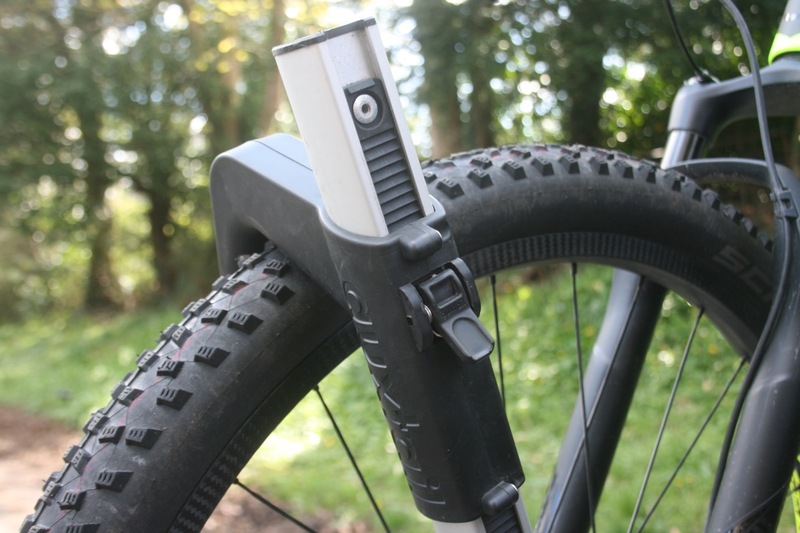 The ‘arm’ has a sliding and ratcheted clamp that holds the front wheel in place – wheels as small as 18in can be accommodated and while capacity goes up to 29in, I struggled to fit my 29 plus bike with 3in wide Maxxis Chronicles. We did struggle to fit a 29×3.0 tyre in. To remove the bike, undo the rear wheel strap, push down on the arm clamp while pressing the release catch and slide the clamp upwards. It really is really simple. Once attached to the car with bikes on it, there was a small amount of side-to-side movement of the main beam in the flange plate, but it wasn’t going anywhere. We used the Auxtail on the back of our car for taking bikes from Scotland to Manchester a few times on the M6, over to Hull to catch a ferry and various other motorway journeys and while the initial journey was a bit tentative due to the apparent (and slight) sideways movement, it worked a treat. The only downsides were some areas where the Auxtail could be strengthened. The sliding clamp mechanism can be easily broken (in our case by our 12 year old daughter) and the bung at the end of the pivoting arm can fly off if the clamp is pulled up too far – both were fixed easily enough without having to buy replacement parts but it’s worth remembering that this is a lightweight rack that isn’t keen on hamfistedness. The Auxtail is an innovative rack that can comfortably accommodate two bikes, using a clamping system that avoids any annoying and potentially-expensive damage. It’s small enough to be stored in the boot of the car if you need to and is light enough to be handled without the risk of a muscle strain. Just don’t be too rough with it. Poll: Where Do You Keep Your Bike? 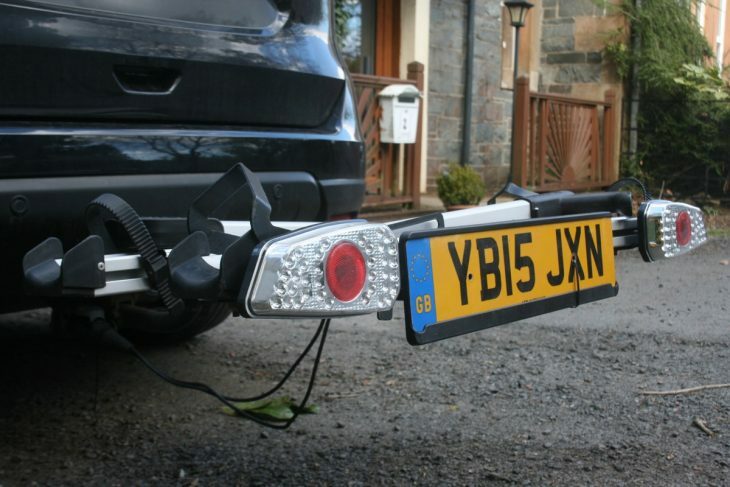 interested because im looking for a new bar mounted carrier however it sounds like it wont fit a removable tow hitch. 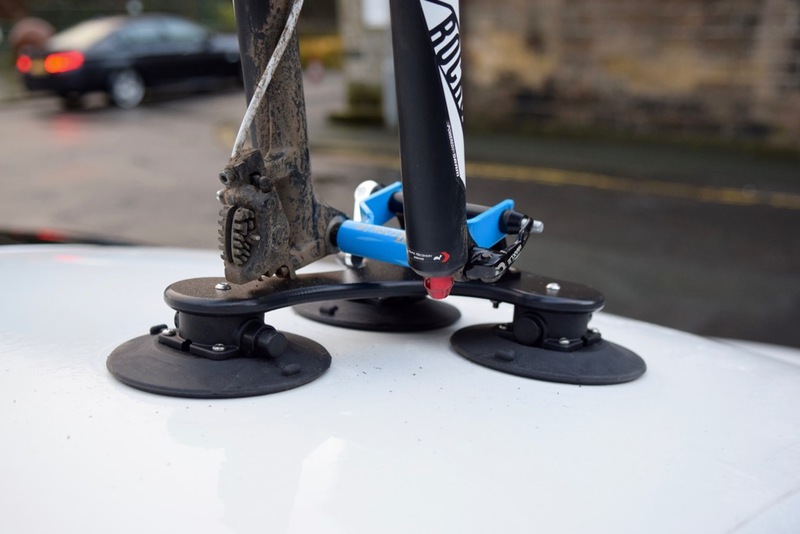 re your comment “Even a ‘compact’ version of a leading-brand towbar-mounted cycle carrier weighs about 60 kilos ” Im sure my Thule basic carrier weighs no more than 15kg’s tops. 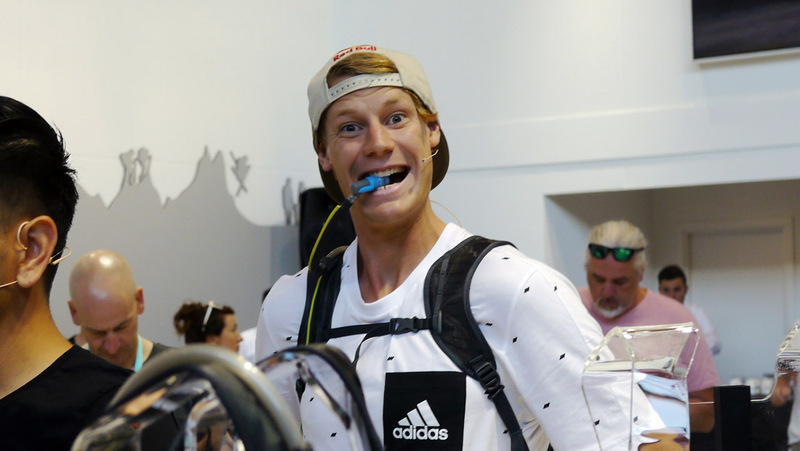 I think that the 60kg remark needs correcting! yeah, 60 is probably overdoing it. 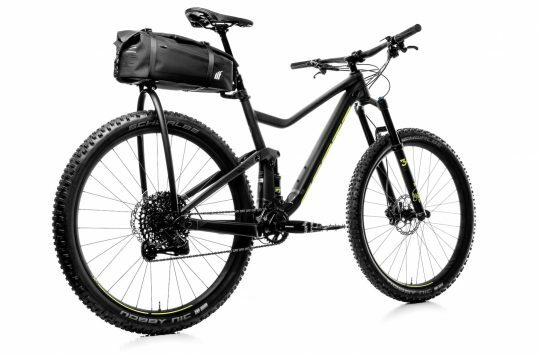 This one’s waaay lighter than my Thule though. Like, half the weight at least. I was under the impression that the square receiver hitch this uses was not legal in the UK. I thought you needed an EU type approved towbar and they hadn’t approved this type. I could easily be wrong as I only looked into it briefly when I noticed that cars here in NZ have the square hitch and I hadn’t seen that in the UK before (not that I was looking that hard). Shouldn’t this one be in the Sponsored Content section? Interesting. Why do you think that, scotroutes? 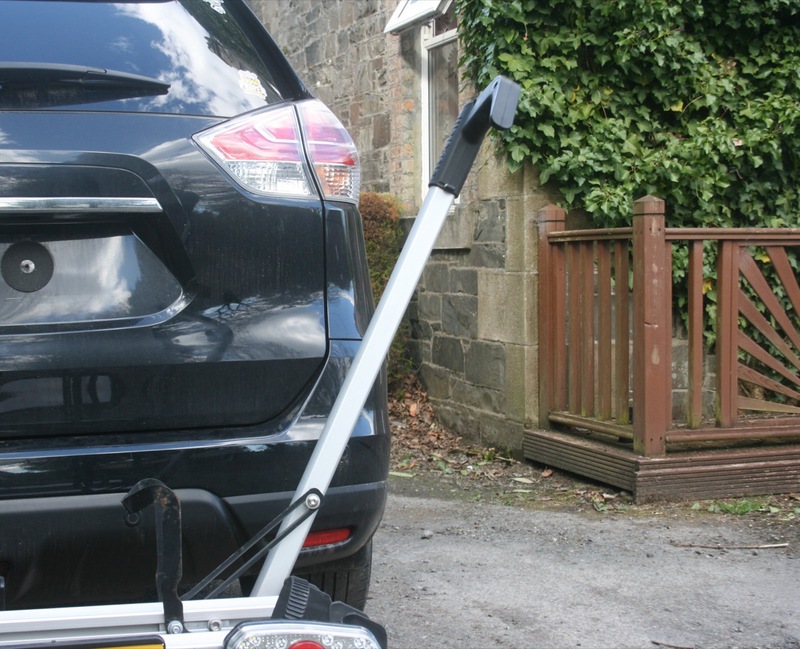 There are no regulations relating to rear cycle carriers, except not to obscure lights and number plate.